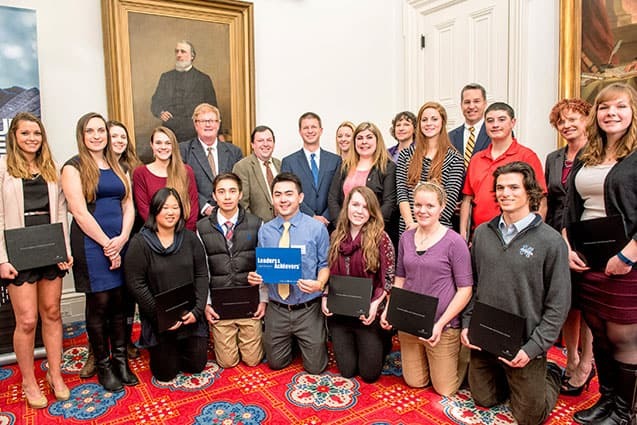 The Comcast Foundation recently awarded 20 Vermont high school seniors scholarships through its annual Leaders and Achievers® Scholarship Program, according to a March 11 news release. The program recognizes students’ leadership skills, academic achievement and commitment to community service. Comcast, joined by Speaker of the Vermont House of Representatives Shap Smith, as well as Jim Porter, director of telecommunications and connectivity at the Public Service Department and Christopher Recchia, commissioner of the Public Service Department, recognized the students at a special event held at the Vermont State House. The 20 recipients each received $1,000 scholarships. One student, Samantha Morse, a resident of Bomoseen and student at Fair Haven Union High School, was selected to receive an additional $9,000 Comcast Founders Scholarship — instituted in honor of Ralph J. Roberts, Founder and Chairman Emeritus of Comcast Corporation. In total, Comcast awarded $29,000 worth of scholarships in Vermont this year. The Comcast Leaders and Achievers® Scholarship Program provides one-time $1,000 scholarships to students who strive to achieve their potential, who are catalysts for positive change in their communities, who are involved in their schools, and who serve as role models. “This year’s scholarship winners demonstrate an exemplary commitment to leadership in both their classrooms and communities,” said Michael Parker, senior vice president of Comcast’s Western New England Region, which includes Vermont. Since 2007, Comcast has awarded a total of $178,000 in Leaders & Achievers Scholarships to 133 students in Vermont. Since 2000, Comcast has awarded more than $25 million in scholarships to approximately 25,000 students nationwide.